FILE - Villagers carry banners reading "Pleading with the central government to help Wukan" and "Wukan villagers don't believe Lin Zulian took bribes" during a protest in Wukan, in China's Guangdong province, on June 22, 2016. Frustration and anger are running high in China’s southern coastal fishing village of Wukan, one day after a court in Guangdong province handed down a guilty verdict for well-respected and influential village chief Lin Zulian. 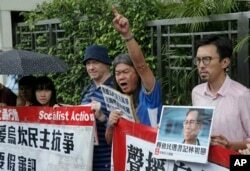 Residents continued street protests Friday despite rain and pledged to continue their strike until Sunday to show their support for Lin. During the planned strike, most businesses, including stores and restaurants, were shut down. On Thursday, the court found Lin guilty on two counts of corruption charges after evidence showed that he had taken $66,384 in bribes and another $22,478 in kickbacks from local infrastructure projects. After a half-day trial, the 72-year-old was given a combined jail sentence of three years and one month, in addition to a fine of $29,970 – a ruling that Lin has accepted and vowed not to appeal. “I’d like to relay my remorse to residents of the village and apologize to my friends and family,” Lin told the panel of judges, reading from a prepared script. “I’ve learned my lessons. And I will now behave and abide by the laws. With trust in the court, I shall not appeal,” he added. This was not the first time Lin has confessed. His first videotaped confession was made public by local authorities three days after his arrest in mid-June, amid speculation that it was forced. That confession also came weeks before his official indictment. “Both counts [of graft] fall into the administration of the village’s self-governance. Should they prove to be true, he would have been found guilty of only one count of bribe-taking as a non-civil servant since Lin Zulian is a village chief, not a public official,” Wei told VOA. “Therefore, I find the verdict unfair after [the court] had indicted him on both charges and ruled him guilty of both charges,” he said, adding that the decision has justified nothing but the prosecutors’ move to go after Lin. In other words, the court’s strict ruling on Lin’s first count of graft should have only applied to government officials, according to Wei. Lin’s son, Lin Zhuang, insisted on his father’s innocence, calling the trial nothing but a backroom “black-box” deal to incriminate his father, according to an Oriental TV report. He also said many of the village’s supporters were barred from going to the court to show their support for the popular chief. During the trial, which was supposed to be open and fair, security near the courthouse was tight, he added. Meanwhile, authorities in Foshan City only allowed three of Lin’s family members to attend court and two government-appointed attorneys to defend him on Thursday after lawyers hired by his family were dismissed. The 72-year-old is seen as a hero by many of the village’s 20,000 residents ever since he led the 2011 local rebellion that threw out the previous government for allegedly stealing land from local residents and re-selling it to big developers. Weeks before his arrest, Lin had threatened to restart protests to press for compensation for villagers. And a day before the planned protest, he was detained on suspicion of corruption. Voicing their disapproval of the court ruling, some residents vowed to continue their street protests as long as the village chief remains behind bars, according to the Oriental TV report. Local authorities have requested that the village stop rallying after Saturday, local media reported. On China’s Twitter-like social media site, Sina Weibo, many expressed displeasure with the ruling. Another user wrote, “A corrupt official? Everyone in the village still supports him. Lin is someone who had stood up to fight for their land rights,” adding that he has been framed for offending higher-ranking officials.